From left: MEP David Casa and MPs Simon Busuttil and Jason Azzopardi walking into the law courts in Valletta. It is not the end of the road for the Panama Papers scandal, with former Opposition leader Simon Busuttil saying that “a number of avenues for justice” remain. The Criminal Court last week turned down a request for an inquiry into the local implications of the data leak. Now a backbencher, Dr Busuttil said that over the past few days, a number of lawyers had contacted him and his legal counsel MP Jason Azzopardi with advice on how to take the case forward. “Having examined all the legal avenues available, we have established that there are indeed a number of options,” he said. 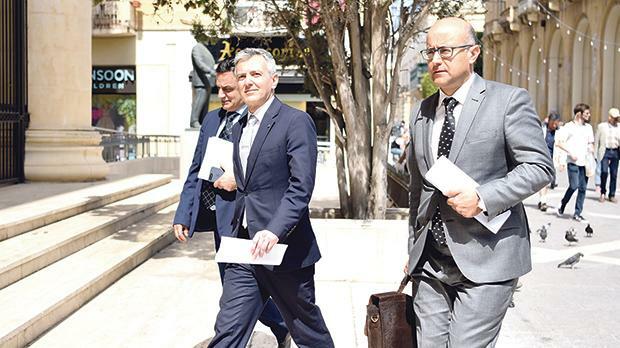 A judgment by Mr Justice Giovanni Grixti last Tuesday found that Dr Busuttil had failed to indicate that any crime had been committed in his request for a probe into the Maltese protagonists of the leak, who include Cabinet Minister Konrad Mizzi and OPM chief of staff Keith Schembri. That case dates back to July 2017, when Dr Busuttil had asked for a magisterial inquiry to be opened into the allegation of money laundering and graft. At the time, Magistrate Ian Farrugia had found that there was enough reason to justify an inquiry, but appeals had been immediately filed against that decision by Prime Minister Joseph Muscat, Dr Mizzi, Mr Schembri, Nexia BT’s Brian Tonna and Karl Cini, and businessmen Malcolm Scerri and Adrian Hillman. Mr Justice Grixti last week found that Dr Busuttil had given a number of facts which in themselves did not indicate any wrongdoing and overruled Dr Farrugia’s decision. Dr Busuttil told The Sunday Times of Malta that a number of people, including a civil society organisation, had approached him offering to file a new request for the opening of an inquiry afresh into the Panama Papers. It was not clear whether this new request would be filed in court by him or a group of people including the civil society organisation. “We owe it to all those people who trusted us to represent them. We hope that our action will send out the message that someone is actually prepared to give people a voice and to fight for what is right,” he said. Dr Azzopardi said the possibility of filing a new request from scratch was a valid option because Judge Grixti’s decision did not amount to an acquittal of the suspected persons. “It merely amounts to a refusal on his part to start an investigation. This does not prevent any other member of the judiciary concluding that there are indeed grounds to open an inquiry,” he said. And Dr Busuttil said that if that road proved to be a dead end, there was another route being considered. The case could be taken to the Court of Justice of the European Union and he would not rule out the possibility of asking the European Commission to investigate the state of rule of law in Malta. The European Commission has already taken action against Poland and Hungary. However, before looking beyond Malta’s shores, Dr Busuttil said he would this week be filing a request to reopen the 17 Black inquiry which he and MEP David Casa had requested last year after the Daphne Project had first reported on the matter. Back then, Magistrate Francesco Depasquale had closed the case on the understanding that the 17 Black revelations would be incorporated in a Panama Papers inquiry. Now that the Panama Papers case had been rejected without an inquiry, Dr Busuttil said Magistrate Depasquale would be called on to declare whether the basis for closing his file now needed to be reviewed.